This columnist spent most of last night researching the law to learn if George Soros could be charged with Sedition and Treason for the damage he is causing the U.S. The goal was to discover if someone living in another country meddles into the affairs, security and destabilization of another country, specifically, The United States, could they face criminal charges based on that law? The definition of Sedition is "to speak or organize for the purpose of insurrection against established order." It also lists, "subversion of a Constitution." Sedition compliments treason. Then there is Seditious Conspiracy, which Webster defines as: "The crime of saying, writing, or doing something that encourages people to destroy the government." The Law Dictionary states that Sedition is: "The crime of creating a revolt, disaster or violence against lawful civic authority with the intent to cause overthrow or destroy." Read this one carefully. George Soros is attempting to deconstruct the constitutional government of the United States and replace it with a Communist-controlled One World Order, destroying the structure of America that was legally put in order. This is precisely what it taking place in America today under the direction of this billionaire Hungarian Jew, who betrayed his own people during the Holocaust, for profit. He is a leader of the One World Order campaign, in partnership with Communist Party USA (CPUSA), that provided the protest signs used in the riots of Ferguson, Baltimore and the other locations, plus paying the "protesters," known to Stalin as, "Useful Idiots," to do their dirty work for them. The world he wants to create will keep everyone in poverty while he lives in unspeakable wealth. Since the laws of Sedition and Treason seem to read that these laws pertain to those who are citizens of the U.S., can we figure a way to bring such charges, based on these laws, to an individual in another country who has imposed himself and ideals on ours in an attempt to overthrow an established lawful nation? Like many, it was assumed that his base of operations would be overseas, possibly in his home country, Hungary. To my utter astonishment, our research found that George Soros lives and operates in The United States! No wonder he was able to get the anti-Trump riots going so quickly in New York. Soros lives in a mansion located in Katonah, New York, and is listed as a "citizen" there. He also has an elaborate summer home in Southampton (Long Island), New York, where he invited Hillary to spend a weekend with him in August of 2015, no doubt to plot the forceful installation of her into the White House. This means, since he lives here, that the laws of Sedition, Treason and Seditious Conspiracy DO apply to Soros, who CAN be charged and put in prison. President Elect Donald Trump, please take note of this and charge him! 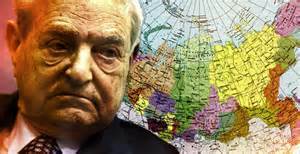 Soros has caused chaos and anarchy throughout the world, has manipulated currency, started wars, recessions and created overall havoc. To indict him would be a favor to the whole planet, even though he has sons who will carry on their father's evil legacy. But this is a start. Also, dispatch the Armed Services to confront these rioters, using whatever force is necessary to put a stop to this disruption of America. This cannot be allowed to continue. This has become war. SPECIAL NOTE TO CHRISTIANS AND PASTORS: Following this election, we all bear a heavy responsibility to walk worthy of our calling and to enhance our commitment to God, who gave this nation one more chance to repent. We must magnify Him constantly with our lives, from our pulpits, and give Him constant Praise. What we just went through was nothing short of a miracle. We were one stop away from losing our country and all human rights. Only God could have brought about the results of this election. This is no exaggeration, considering how Soros put up every road block possible to stop Donald Trump. The leftist media published false polling numbers that inaccurately stated that Hillary had the highest poll numbers in order to discourage Trump voters. That almost worked. They blared in their headlines that he was failing, dividing the country, was hated by all, and had no chance to win. And in the natural, he did not have a chance to win with that kind of skilled orchestrated opposition. Even now, after the election, the Soros controlled newspapers and overall media are headlining more propaganda against Trump to keep the people stirred up. He is attempting to instigate an all-out revolution. This can come to an end by rightfully and lawfully charging him and putting him in prison. What reversed that severe satanic battle? PRAYER. Deep heartfelt prayer by thousands of ministers and lay Christians. The prayers were heard and God responded by giving victory in the face of the impossible. Be sure to read this story before going further. We, as Christians, Chaplains and Pastors, have a profound obligation to hammer home that God intervened this one last time, that we must get our houses in order, and to bring our petitions and praises to God in a clean vessel. Isaiah 52:11 states clearly: "Be ye clean, that bear the vessels of the Lord." As Christians and pastors, you ARE the vessels of the Lord. So, if you expect to bring results for God, KEEP THE VESSEL CLEAN. Never forget WHO you are and the sacred position of trust that God has bestowed upon you. During this evolving time in history, we must preach honestly and forcefully – meaning with authority – without any compromise of God's Word. It is up to all Christians and pastors to make certain that congregations understand the seriousness of walking out our devotion to Him during these last days. As for President Elect Donald Trump, for many years he attended Marble Collegiate Church in Manhattan. I lived in New York at the time. Then a couple of weeks ago, he prayed the sinners' prayer with TV minister, James Robinson, to make certain that he was right with God. The rest is up to us. So, Stand Ready – Be Prayed Up – and...Keep the Vessel Clean.